As we sleep, our tongue and the muscles in our throat tend to become very relaxed. In certain individuals, the tongue can become so relaxed that it drops back into the airway, sometimes creating too narrow of a breathing passage and blocking proper airflow. This can lead to loud snoring and/or pauses in breathing that may last 10 seconds or more, both of which are commonly attributed to sleep apnea – a condition that can result in a number of serious health risks if left unmanaged. 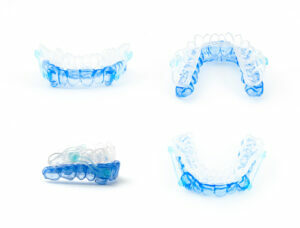 Thankfully, there are a variety of options that can be used to care for sleep apnea. Here at Scottsdale Smile Center, our dentists – Don Chiappetti, DDS and Jonathan Coombs, DMD – treat sleep apnea by fabricating customized mouth guards that help to keep your airway unobstructed throughout the night. Tailored to fit comfortably over your teeth, these innovative appliances are designed to ensure a good flow of air is maintained through both the oral and nasal passages as you sleep. By doing so, the harmful effects of sleep apnea can be greatly diminished, and you may once again be able to enjoy a deeper, more peaceful night’s sleep. For more information about sleep apnea treatments, or if you would like to schedule an appointment with Dr. Coombs or Dr. Chiappetti, please feel free to contact our practice today.